This walk connects with the City Centre and West End Walks in the same series. It takes you around the periphery of the historic town from the East Port, along the braes of the Law, following the ancient route of Bucklemaker Wynd through the Hilltown of Dudhope past Our Lady Well, then up to the Dudhope estate with its castle, then through industrial heritage to the West Port. Hence City Braes, exploring surrounds of the city centre. Up until the industrialisation of Dundee in the 19th century, the town was very compact, the area of our City Centre walk. In 16th and 17th century Dundee a town wall developed, to define trading areas and keep out unwanted pestilence. Until the late 18th century much of the area outside the built-up town was open countryside. The 16th century wall was mostly formed by the backs of houses and had to be kept secure. There were seven main gateways into the town. West Port commemorates the location of the principal gateway to the route to Perth and the East Port was other principal gateway on Seagate. Other ports (some were lightweight ‘barras’) were at Nethergate, Friar Wynd (later Barrack Street), Wellgate, Murraygate and Cowgate. In Scotland and Scandinavia a ‘port’ is a gateway and a ‘gait/gatte’ is a road. Two major burns also flow to either side of the centre and in early times both were diverted and harnessed to provide power for grain mills in the town centre, before passing on to the sea. They have long been culverted underground, but their influence remains. Mechanised flax spinning and weaving began in Dundee from the late 18th century, initially using hands and feet to power machinery, but water was still necessary to create steam power and for the manufacturing processes once they became industrialised. The Dens Burn is to the east (line of Dens Road), and it flowed south to where the docks were developed. A lade known as Tod’s Burn ran above the Cowgate, passing along modern-day King Street to the city centre. The Scouring Burn runs eastwards from Balgay and Logie Den, its route becoming ‘Brook Street’ in the 19th century. It then fed a large mill pond at modern day Brown Street, continuing through the Ward Lands to the mill dam in the Meadows. This was once a valley of verdant meadows sloping down to the burn, which flowed gently in the shadow of great trees. It was separated from the town by a ridge of higher ground, quarried away in the mid 19th century. 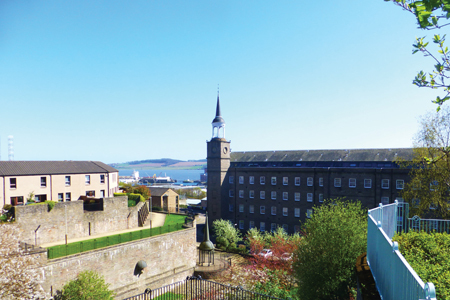 Through the 19th century the textile mills encroached on both sides of the city centre, leaving Dundee with a tremendous industrial heritage for which new uses have gradually been found. The land between the main mill complexes was historically used for housing by different groups of society, and our walk passes from area to area, experiencing both the heritage of the past and the rich and varied cultures of today’s city centre population. Cowgate, one of the town’s principal streets running east, is still a pedestrian-friendly route from the centre’s Murraygate under the ring road. It once led to the Dens Burn and grazing pastures. 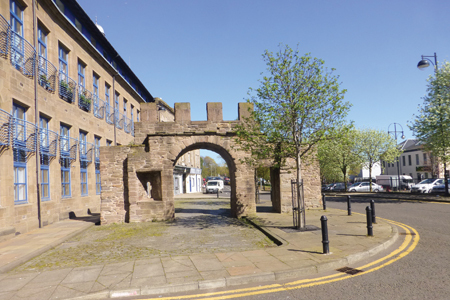 The centrepiece is the Cowgate Port, the main survivor of the town’s 16th century wall, now enclosed by a leafy car park and former mills. Downhill is Seagate, the route east and site of the principal East Port gateway. Our route west of Hilltown follows Dudhope Street, once the main approach to Dudhope Castle. The east section is relegated by the North Marketgait ring road to being a footpath from Hilltown. 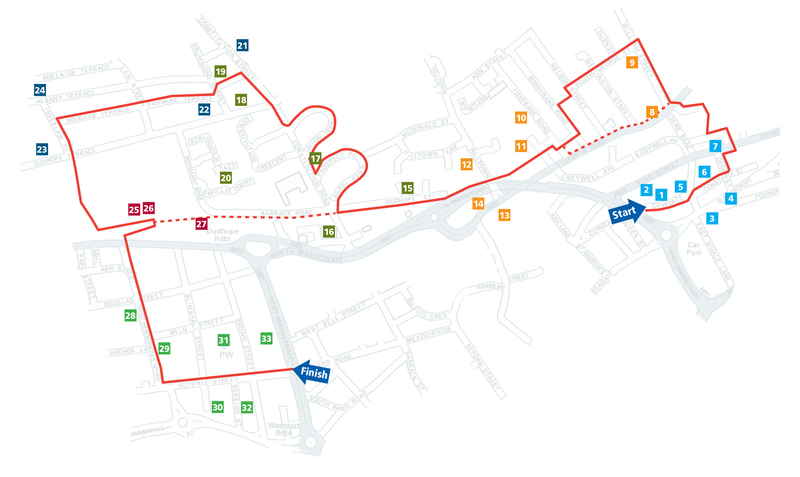 Chapelshade, downhill of this route, is mostly in the city centre area (explored in our City Centre Walk). East Chapelshade was Dundee’s first villa suburb with its own ‘chapel of ease’ (now the Abertay University area). Uphill from Dudhope Street, is Dallfield, once an area of dense housing and now mostly open, and further up, the evocative Rosefield and Rosebank. By the late 18th century the Dudhope estate was separate from the Castle, and comprised farmland encompassing the Law. In the 1760s the land with a modest house was bought by local merchant John Rankine, and it passed through his family, with each branch feuing land for houses as Dundee expanded. Gardner and Campbell descendants are commemorated by street names. George Angus’s 1838 feuing plan for David Rankine envisaged a hillside peppered with classical villas, though only six villas along DudhopeTerrace, and two single storey villas behind at Panmure Terrace were built. Historically the lands of Dudhope Castle extended wide and north to what is now the Kingsway. The Scrimgeour family, the owners, were the Constables of Dundee. The Castle was first built in the early 1300s to replace the original Dundee Castle, destroyed c.1312. It passed to the Maitlands, then briefly to Graham of Claverhouse, ‘Bonnie Dundee’, then to the Douglas Earls of Forfar. Whilst serving as a barracks a parade ground was created, and new buildings included officers’ quarters, a hospital, store rooms and a guard house. By the 1800s the community to the west of this area was referred to as ‘Scouring Burn’ from the burn passing through the area. Uphill towards Lochee Road was the Pleasance, developed into nursery and market gardens but previously the gardens of Dudhope Castle. 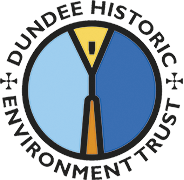 Although Dundee had manufactured textiles for centuries, mechanised technologies first became available in the late 18th century and the earliest surviving flax spinning mill is in Guthrie Street, and much survives from the early 19th century. 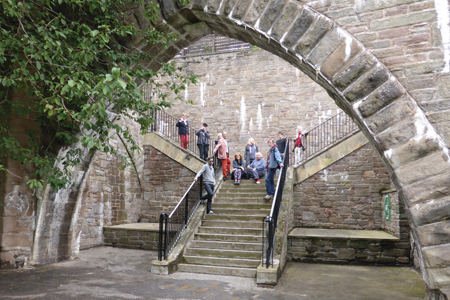 The Cowgate Port is one of only two surviving burgh gates in Scotland. It dates from the early 16th century, was repaired in 1592 and subsequently, and was possibly only spared when General Monck was destroying Dundee’s defences in 1651 because it is associated with protestant religious reformer George Wishart. He was said to have preached here in 1544. Between King Street and Cowgate the East Port Calender Works, now converted and extended for housing. It included an 1830s mill and a substantial 1913 steel-framed building for jute finishing. The 1870 Dundee Foundry (now M&S foodstore & cafe) opposite, was relocated within Gallacher Retail Park in 2006 and retains the cast iron framework and travelling crane of the machine shop interior within a new shell. Here Gourlay Brothers made marine engines, including those for RRS Discovery, and Preston Watson made his early aeroplanes. At the corner of Blackscroft the little classical former St Roques Library (now a nightclub) by James Thomson, city architect, 1910, is a reminder of a more substantial residential community. Above the signmaker’s shop (once a pub) the former Wishart Memorial Church of 1841 (known as ‘heaven and hell’) was where celebrated missionary Mary Slessor worshipped; she lived nearby in Queen Street and worked in Upper Dens mill. The Wishart congregation moved to the larger Art Nouveau detailed church on King Street (TM Cappon 1901). It subsequently became part of the city centre Steeple Church. Baxter Brothers were substantial linen manufacturers, originally harnessing the Dens Burn for power here in 1822, and had a vast complex of mills extending north and east of here. Lower Dens works comprises four substantial flax processing mills around a courtyard, the earliest is 1830s. The Baxter legacy in Dundee is obvious at Baxter Park, but they also instigated the colleges that became Dundee’s two universities and art college. Victoria Road partly originated as Bucklemaker Wynd, the principal entry from Forfar; it was extended and widened in 1870. Uphill, it continues north east as Dens Road, the culverted route of the Duns Burn which provided water for other mills. To omit Forebank, follow this busy route downhill to the junction of Hilltown, passing A&S Henry’s magnificent baronial Calender (finishing works) of 1874-75, later offices, more recently restored and converted to housing after a devastating fire. Across Victoria Road and up William Street allows an interesting wander through Forebank. By the early 1800s the sturdy villas of the wealthy, set high on the slopes for smoke-free views, such as Hillbank - the small estate of Dr Thomas Wyse funded by his fortune made in Jamaica - were beginning to be encroached by denser, infill tenement and terraced housing for the influx of textile workers. Other houses included Forebank, Bellevue, Olivebank and Bonnybank; street names also commemorate Napoleonic War heroes. A zigzag route along South George Street and then down and across each of the side lanes gives a good impression of this often ignored area of 19th century architectural development. David Maxwell of Tealing feued his estate around 1780 and commemorated his children in the street names of Maxwelltown: Alexander, Ann, Eliza, George, Elizabeth and William. At Forebank Road, the view uphill is enlivened by the twin gilded campaniles of St Mary’s Forebank R C Church, an Art Nouveau frontage (W G Lamond, 1900) to the very large 1850 church and school complex. On the far side of Eadies Road is Hilltown Park, an oasis of landscaping behind A&S Henry’s Calender building and the long established Little Theatre. Hilltown’s early clusters of houses and shops have mostly now been replaced by newer housing, interspaced with gap sites. Wellgate was a short street connecting the Lady Well with the Murraygate. It became a principal shopping street in the late 19th century, its famous steps replacing a steep brae in 1870, and replaced by the Wellgate shopping centre in the 1970s. Our Lady’s Well, a principal source of good water, supplied four city centre wellheads with piped water in 1744, but it became contaminated and the wells were eventually superseded by mains supplies in 1874. Its location is commemorated by the nearby Ladywell Tavern. Hilltown connects west towards Dudhope Street by a footpath set above the ring road, immediately uphill of the bridge, keeping left. Villas on Dudhope Street are from the early 19th century, with the later tenements of Garland Place and Rustic Place (William Alexander, 1870s) at the junction with Constitution Road. Downhill is a fine 1867 Gothic revival church with prominent fleche tower and outstanding stained glass collection; St Mary Magdalene’s Episcopal Church congregation relocated here in 1952. The Crescents (from Dudhope Street uphill) were laid out as 'Chapelshade Gardens' by 1834. Most of the villas in the five curving rows were built in the 1840s and 1850s to the designs of David MacKenzie. The former college and modern houses opposite are on the site of the town’s bleaching green. Several houses retain distinctive gaslight brackets above their gateways as well as signs of good ironwork and railings. Weeping ash and Camperdown elm trees were fashionable and some impressive specimens can be seen. Somerville Place, the early terrace of four cottages, was built by James Black in 1830, extended in the late Victorian period. The eastmost one has a look-out tower and rear billiard room, originally connected by a conservatory bridge, added around 1890. The Dundee and Newtyle Railway was one of the earliest railways and opened in 1831. It connected with the valley of Strathmore beyond the Sidlaw hills, and utilised waggonways, horsedrawn carts, and stationary steam engines to haul the carts up the steep inclines and a 300yd long tunnel through the Law. The line was bridged over by Barrack Road and went underneath Somerville Place; the route was relocated via Lochee in 1861. Below Drummond Street is the cutting and incline which led to the Law tunnel; the high stone walls protected the adjacent houses. The tunnel still exists but is inaccessible. The former Dundee Royal Infirmary closed in 1998 and is now private housing. It was designed by Coe & Goodwin of London and opened in 1855. It initially held 280 patients, one of the first to separate medical, surgical & fever wards, then Dundee’s biggest public building. The costs of running it came from donations prior to setting up the NHS in 1948. The red brick Caird Wing was added behind in 1907. The first housing schemes to be built after WWI were at Stirling Park and Logie, and had district heating systems. A single coal fired boiler supplied hot water to each of the homes through underground pipes. The original pump house can still be seen at the top of Stirling Avenue. The six two-storey classical houses along Dudhope Terrace and the two single-storey villas behind were designed about 1840 by Edinburgh architect George Angus. Druimbeg, the 1909 Art Nouveau villa at 3 Panmure Terrace is by Edward Tough who designed similar houses in Maryfield, before emigrating to work in the Chicago area. Dudhope House is in the 17th century Scots style, and was built for David Rankine by the Glasgow architect Charles Wilson in 1849-50 with little remaining of his father’s 1760s house. Wilson designed a lookout tower, but it was never built. Steps and footpaths take you further up the Law for fantastic views over the city if you wish to extend your walk. Viewpoint information panels describe the Law’s history and archaeology. As you climb, the houses become more modern at each level of streets. Dudhope Castle is impressive in its present form and represents the surviving parts of a larger complex with two connecting ranges forming an L plan building. The south west range dates from 1588; the north east range from 1684, on the site of a keep of 1460. It was converted to a woollen mill in 1792 and then a barracks in 1799, with significant loss of its historic form. It was acquired by the Council in 1893 and used by local societies, gradually declining until there was little left of the interiors by the time of the 1985-89 restoration scheme. The small stone Wellhead on the south front of the castle is one of four built in 1744 by the council, to provide piped water from the Ladywell to city centre gathering points. This was first in the Overgate at Tally Street, then moved a short distance to Midkirkstyle in 1828, then to here in 1897; then operational with a cast-iron lion mask spout and draw lever. Dundee’s Time Gun was installed in August 1872 in front of the officers’ quarters at the castle and intended as a time signal for the docks, common in other port towns. The firing time was transmitted from Calton Hill, Edinburgh. The original twelve pounder gun dated from 1813 and had been captured from the Russians during the Crimean War. The gun was fired daily at one o’ clock until it caused upset to shell-shocked soldiers in 1916. Firing then resumed from 1924 on New Year’s Day and Armistice Day; it ceased altogether in 1936 after the fuse failed. Meadow Mill (1874, as North Dudhope Mill) was a jute spinning mill, built as fire destroyed the previous works. It is tall, due to lack of ground availability. Now a thriving Wasps Studios artists’ complex, with open days. Verdant Works (from 1833 as a flax mill) is one of the most complete small jute mill complexes anywhere. Conserved as a textile museum opened in 1996 it features demonstrations of working weaving and spinning machinery in their original setting. There is a café. The last mill working in Scouring Burn was Queen Victoria Works on Brook Street; by 1987 it was the world’s oldest operating jute mill, but it closed soon after. Avertical World was the original St Mary Magdalenes’s Episcopal mission church and had a vast hall and school complex nearby. It has interesting internal features. There were other churches as well as schools, housing and shops in Scouring Burn providing for the needs of the workers. Dundee Mosque (Lucas Dow Design Studios, 1996-2000) is a purpose built Mosque, rich in Islamic symbolism. Other historic buildings nearby have been reused by the Islamic community, contributing to the regeneration of the area. South Mills in Brown Street was begun in 1825 as a flax mill with additions in 1850s to 1870s and was successfully converted to housing in the late 1990s. Tay Works (1851 on, with additions of 1863-65) was built as a jute mill; it has an impressive 58 bay long frontage overlooking Marketgait, now mixed uses including flatted accommodation. Look out for the chimney and boiler house (now a café) and the iron weighbridge.